Based on a talk given at Sri Aurobindo International Centre of Education on the occasion of Dr. Syama Prasad Mookerjee's birth centenary, this book highlights his major contributions to Indian education and politics. 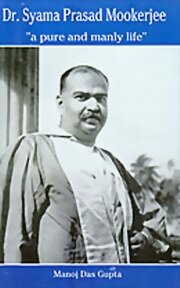 Later known as "the lion of the Parliament", Mookerjee was an ardent son of India who led a courageous crusade against the partition of Bengal. The Mother chose him as chairman of the Sri Aurobindo Memorial Convention in 1951, where he concluded his speech with a call for India to fulfill her destiny and for the world to heed the voice of Sri Aurobindo and his message for the future of humanity. Title: Dr. Syama Prasad Mookerjee: "a pure and manly life"